When it comes to tournaments, kumite is generally a little easy to work out the winner because you have visible evidence, i.e. did he or she block the oncoming technique or not? Kata, on the other hand, can be very difficult. 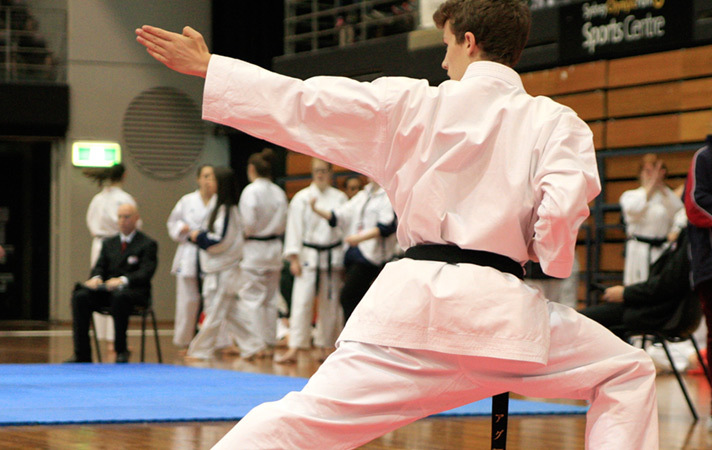 For one, you have numerous competitors performing different Kata. Then, with those performing the same Kata, different people have different strengths. As an example, one person might be slighter stronger but another slightly neater. One might have cleaner hands while another cleaner stances, these are just a couple of variables that judges have to contend. If each individual judge was to award their own Gold, Silver, and Bronze, the winners and/or placings might not always be the same. With many variables to contend with, each Judge may score these variables differently. Going back to our above example, one may score the competitor with neater hands 0.1 higher, another might score the competitor with neater stances 0.1 higher, while the third may give tied scores. Having three judges is the fairest way to establish a winner because it means the Gold medallist is the competitor who has impressed the greater number of judges. Let’s assume for a moment, in each kata division there were not one, but three Gold medals. A Gold for the person with the best head area (focus, head turns, breathing etc). A Gold for the person with the best torso (speed, snap, fluency, clean technique, timing etc), and a final Gold for the person with the best lower section (correct stances, fluent or speedy movement, balance etc). Your thinking should be that you would take out Gold in each zone. Rate yourself in each zone. Would you perhaps get a medal in the torso area but fail to place in the lower section? Would you win a medal in the head area but fail to place in the other areas. This type of questioning helps you formulate a better plan of attack for your next tournament. While judges are not scoring with this hypothesis in mind, they are looking for things such as timing, technique, balance, focus, stances, snap, speed etc. By developing each component vital to success in each zone, you are more likely to win favour over the greater number of judges. Understanding this, we get the most potent tip for developing winning kata, that is, cover all your bases. Watch any old Kung-fu movie and you will hear conversations similar to, “My eagle claw will defeat your tiger paw”. They were always claiming that their chosen style would defeat someone else’s. When it comes to Kata, you cannot assume your powerful punches will defeat your opponent’s snappier finish. You cannot assume your deep sumo stances in Seiunchin will defeat your opponent’s focus and speed. Too often a student hopes their strength (such as their strength, or focus, or speed) will win the event for them. But a judge may weigh up their strengths and weaknesses and decide another competitor, overall, has better Kata. Don’t rely on your strengths and neglect your weaknesses. Cover all the bases and you have a far greater chance of victory.